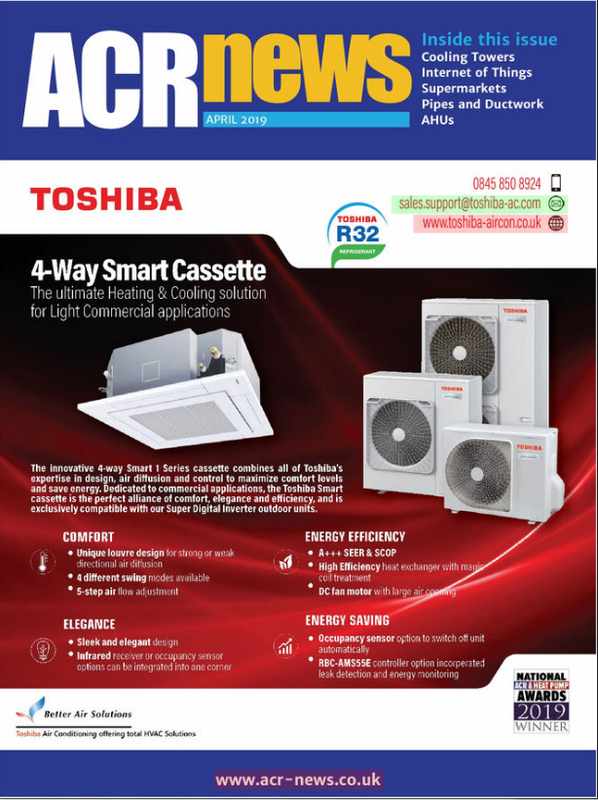 This month we look at the question of noise and acoustics and their relationship with the refrigeration and air conditioning industry. Hearing is something we all take for granted, but is one of our main senses for living, communication and in some cases survival. The air fluctuations we recognise and sense as sound play a very important role in all our daily lives, providing us with the ability to communicate effectively, enjoy entertainment and maintain awareness in our environment. 50mm thick acoustic panels to be fixed to vertical walls 50mm thick acoustic panel on roof supported on folded galv. supports and RSA/folded glav support leg. All solid and perf surfaces to be painted to a standard BS/RAL colour Most common sounds are either, enjoyable, tolerable, non-intrusive and necessary, even calming in some situations. However, excessive, impulsive or tonal sound can be classed as noise and be irritating, debilitating and, in extreme cases, dangerous. An example, I am sure we can all relate to, of both sound and noise in their different guises is loud music. Listening to loud music, in say, a nightclub is enjoyable sound. However, in a nearby residential property, where only part of the music, usually the bass beat, is heard, the same sound manifests itself as an unpleasant noise.This notion is also true for the sound generated by air conditioning and refrigeration equipment whereby the operation of plant becomes intrusive noise to those living or working nearby. Noise for the most part is the one commercial pollution we can successfully deal with, but the relatively high cost of acoustic treatment has always remained at bar.One universal definition of noise pollution is unwanted sound. For most of us too much sound or the wrong type of sound is usually referred to as noise, but we are often left without the ability to describe how loud the noise is. The threshold point of when sound becomes a noise is the most difficult area to assess and is often a personal experience and may even change with our mood or state of health.Historical development of sound detectionThe academic investigation of sound and its transmission began in the early part of the 20th century and many varying types of assessment criteria have been developed to try and describe various noise types.One factor which shows the prominence given to sound research and noise is that international standards exist so that a noise measured in the UK would be described identically if the same noise occurred in say China.The subject of sound is vast and the intention of this article is to focus on the refrigeration and air conditioning aspects of noise and its treatment. One of the descriptions used regularly to describe noise control is a 'black art'. This is due to the fact that practitioners use what appear to be incomprehensible calculations and judgement, in equal measure, to generate treatments for unwanted sound. Hearing is something we all take for granted, but is one of our main senses for living, communication and in some cases survival. The air fluctuations we recognise and sense as sound play a very important role in all our daily lives, providing us with the ability to communicate effectively, enjoy entertainment and maintain awareness in our environment. Most common sounds are either, enjoyable, tolerable, non-intrusive and necessary, even calming in some situations. However, excessive, impulsive or tonal sound can be classed as noise and be irritating, debilitating and, in extreme cases, dangerous. An example, I am sure we can all relate to, of both sound and noise in their different guises is loud music. Listening to loud music, in say, a nightclub is enjoyable sound. However, in a nearby residential property, where only part of the music, usually the bass beat, is heard, the same sound manifests itself as an unpleasant noise. This notion is also true for the sound generated by air conditioning and refrigeration equipment whereby the operation of plant becomes intrusive noise to those living or working nearby. Noise for the most part is the one commercial pollution we can successfully deal with, but the relatively high cost of acoustic treatment has always remained at bar. One universal definition of noise pollution is unwanted sound. For most of us too much sound or the wrong type of sound is usually referred to as noise, but we are often left without the ability to describe how loud the noise is. The threshold point of when sound becomes a noise is the most difficult area to assess and is often a personal experience and may even change with our mood or state of health. The academic investigation of sound and its transmission began in the early part of the 20th century and many varying types of assessment criteria have been developed to try and describe various noise types. One factor which shows the prominence given to sound research and noise is that international standards exist so that a noise measured in the UK would be described identically if the same noise occurred in say China. The subject of sound is vast and the intention of this article is to focus on the refrigeration and air conditioning aspects of noise and its treatment. One of the descriptions used regularly to describe noise control is a 'black art'. This is due to the fact that practitioners use what appear to be incomprehensible calculations and judgement, in equal measure, to generate treatments for unwanted sound. • LAeq: the same quantity, ie dBA, but measured over a specified time period. This is the most commonly used indice in modern acoustic measurement, term being an abbreviation of the continuous equivalent 'A' weighted level. • Lmax: the maximum level over any measured period. It is related to the human ear response time of 125 milliseconds. • Frequency analysis: a system of analysing sound waves using mostly octave and third octave frequencies. This analysis enables an acoustician to evaluate the offending frequencies and design a suitable solution. • Octave bands: an internationally standardised system of frequency banding used in noise measurement. Octave bands are designated by the centre frequency which is double that of the adjacent lower band covering 10 bands ranging from 31.5Hz to 16KHz. • Third octave bands: defined as octaves but split into 30 bands over the same range, ie, three per octave. Noise: unwanted sound. This can manifest itself as loud noise, irritating tonal noise or persistent impulsive noise which becomes a nuisance and a problem to the receiver. Sound level monitoring equipment is readily available from a number of specialist manufacturers. ISO and British Standards control calibration and correct environmental procedures for the use of this equipment. Training in the correct use and interpretation of results is essential. Legislation exists in the UK to control noise in the form of the Environmental Protection Act (EPA), planning acts and licensing laws. Below is an explanation of how these laws work and the various levels of responsibility that exist. Delays associated with this legislation can affect the commencement and progress of a project. 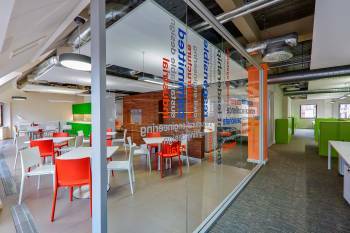 All new or major refurbishment projects require local authority approval. Incomplete or late applications for installations or changes can cause deferment of approval or even refusal. Planning legislation as set out in the Town and Country Planning Acts is a powerful mechanism to moderate local developments. Within this legislation any installation either complies or not with reference to the approval documents, installation of, or changes to retail refrigeration or air conditioning plan, generally come under the scrutiny of local authority officers and elected councillors. It is important that information supporting an application is comprehensive. Knowingly cutting corners or not providing key information about proposed installations is folly in today's climate as the end user always picks up the tab when problems occur and this can obviously generate a knock-on effect to the contractor. Local authority enforcement measures can be draconian, ranging from stop notices to removal of plant. Licensing laws mainly affect the leisure industry which is of course a major user of air conditioning plant. The new Licensing Act enables local authorities to impose conditions for plant operation including noise performance. Non-compliance can result in loss of licenses, which, in turn, can result in closure of a venue. Assessment is often carried out using EPA procedures. Again, the end user picks up the tab and, of course, no license, no business. The control of noise affecting neighbours from refrigeration or air conditioning plant after store opening is enforced through the procedures in the EPA. This legislation is effective, but slow in application, because of the long evidence-gathering procedures needed. Noise nuisance notices under Section 80 of the EPA are powerful instruments and can result, on conviction, of fines of up to £20K, plus legal costs. Council planning officers and licensing officers play a key role in the decision-making process. However, the environmental health officer (EHO) is the common denominator in councils insofar as noise issues are concerned and is the person to convince that noise from plant is within the relevant guidelines. The role of the EHO carries substantial statutory authority, including powers of entry for investigations to any commercial site without prior notice and the ability to investigate noise complaints without consultation. They serve EPA Noise Nuisance Notices, issue noise conditions on public entertainment licences and act as the council's expert advisor on noise issues, including planning applications and health and safety. They support other council officers if stop or enforcement notices are served. Many of us are unaware of the noise levels we are occasionally subject to and the effect it has upon us. For example, you might be dining in a busy restaurant, which has a simple supply and extract ventilation system to provide the occupants with fresh air and to remove odours generated by food, cooking and so on. Perhaps you've noticed the tremendous feeling of relief when the restaurant manager turns off the noisy ventilation system that you hadn't noticed earlier but has been subconsciously wearing you down during the evening! We should be supplied with fresh air at the rate of approximately 8-12 litres per second per person. A restaurant catering for 100 diners and staff would therefore have a supply air volume of between 0.8m3/s and 1.2m3/s. It's very likely that many ventilation systems are over-sized and thus too noisy. In order to protect us in this regard, local authorities have set guidelines and limits for outdoor noise levels, which must be complied with or an Installation might otherwise have to be removed altogether. Typically, the local authority might stipulate that the equipment peak sound power level will have to be a specified amount below the prevailing ambient surrounding noise levels. In the case of metropolitan areas, the threshold is typically low and the limits are strictly controlled. This is primarily due to the enormous amount of noise-generating equipment of all types, traffic and other noise sources, coupled with the density of this region. These days, most cooling systems are fitted with low ambient control to enable the refrigeration circuit to run at reasonable discharge pressure in order to avoid over-condensing. This is paramount where long and/or vertical liquid lines apply in order to deliver adequate liquid refrigerant to the expansion device and to overcome gravity. Low ambient control can be achieved in a number of ways, but one of the most common is that of modulation of the speed of the outdoor unit fan motor in order to vary the airflow rate. As the ambient temperature falls, the heat rejected by the outdoor unit coil increases and the discharge pressure/condensing temperature starts to drop. When this approaches a preset limit, the airflow is reduced, thus impairing the performance/efficiency of the outdoor coil and discharge pressure/condensing temperature are thus maintained at the required level. If the system is also a reverse cycle heat pump, the maximum performance and heat energy extraction is required at the outdoor coil (now the evaporator). Consequently, low ambient control is thus disabled and the outdoor fan/motor will be driven at maximum speed (and maximum noise level). However, there is another advantage in being able to vary the outdoor unit fan motor speed. If the system features a variable speed/capacity compressor, the fan speed and airflow can be varied to balance the heat rejection/heat extraction required at lower load conditions. If we bear in mind that a change in ambient temperature affects not only the equipment capacity and power input, but also causes a major impact on the building load, then the range of conditions under which the equipment operates will be very wide. As manufacturers design such equipment to run at a prescribed peak ambient condition, for example, 43°C, to cover operation in hotter climates than ours, it is clear that when running in the UK, both the compressor and fan motor may never run at the full speeds they are capable of. However, the noise data produced by the manufacturer will almost certainly apply to the equipment running at the highest compressor and fan motor speeds. It is therefore very likely that we are applying extensive sound attenuation measures on occasion that might be of lower specification. Unfortunately, it would be very difficult for manufacturers to measure (or calculate) noise level data for the ambient condition in which the equipment of going to operate and thus such information is not normally available. This could be addressed by installing the equipment, taking noise measurements at the site, under peak operating/load conditions and then applying the necessary sound attenuation, if required. However, one might not be permitted to install the equipment until agreement over noise issues has been settled with the local authority. Moreover, sound measurements are expensive as these involve the hire of specialist equipment, which is installed at site to record data and then collected for analysis and reporting. If the A/C equipment is of reverse cycle heat pump configuration, it may run at peak speeds and noise levels during start-up or defrost and so the highest noise levels, as documented by the manufacturer may have to apply. If it becomes necessary to overcome sound level limitations set by the local authority, there are a number of solutions. Where bespoke systems are to be installed, such as a water chiller with a remote air cooled condenser, low noise versions of such equipment are available. Packaged water chillers can also be purchased with low noise options. It is sometimes possible to install packaged outdoor units within a plant room that is suitably ventilated, thus preventing noise breakout from compressors/fans. The outdoor unit of large multi-split systems are frequently installed within internal plant rooms and then ducted to outdoor air. This is not to be recommended since this type of equipment is not designed to overcome the static resistance of ductwork and grilles/louvres. Where standard packaged equipment is concerned, low noise options are not normally available and it may then be necessary to take more drastic action. This situation recently arose in central London. We were recently contacted to assist in solving a critical noise problem where a small 10kW outdoor unit for was to be positioned in the garden of a prestigious domestic property, valued at around £5M. In addition to meeting the requirements of Westminster Council, it was also necessary to satisfy the strict rules set out by the governing company/landlord regulating all aspects of this group of apartments. Accordingly, a specialist company recorded ambient sound level readings over a period of two days. 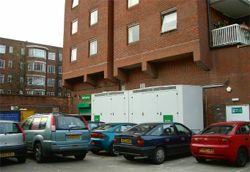 We then brought to the landlords attention the fact that the air conditioning system would not be running at peak speed/capacity/noise levels, but as were unable to secure sound data for the outdoor unit when operating at 35 deg C, we were compelled to submit the standard peak noise level data. 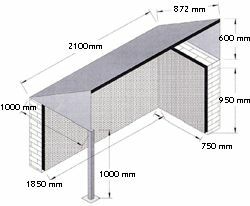 Unfortunately, the documented noise level of the outdoor unit exceeded the allowable noise levels and it was then necessary to consider the construction of an acoustic enclosure. Moreover, given the garden of this ground floor apartment is overlooked by many other apartments, it was deemed that the outdoor unit must not be visible from above. The enclosure therefore had to conceal the outdoor unit when viewed from above. The outdoor unit is to be positioned with discharge air facing the long wall of the acoustic enclosure, leaving sufficient access for service work. The hot discharge air will rise naturally from the sloping roof of the enclosure. The walls of the enclosure are lined with a sound-absorbing material to soak up the airborne sound energy, thus limiting noise breakout to the surroundings. Placing the equipment within a very special acoustic enclosure can dramatically reduce noise emission for many types of outdoor unit and supermarket refrigeration systems. Breakout/airborne noise is substantially reduced to very low levels by folding the discharge air around corners within the enclosure, whilst presenting a very small resistance to airflow rate. 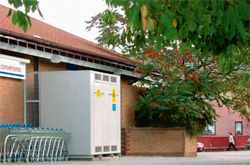 Inevitably, such enclosures are considerably larger than the outdoor unit, but this must be accepted if massive noise reduction is to be achieved.